Technology activist, commentator and entrepreneur, Joi Ito, has been awarded an OII Lifetime Achievement Award in recognition of his role as one of the world’s leading advocates of Internet freedom. Recently appointed as the next director of the famously innovative MIT Media Lab, Joi Ito is a vocal activist defending Internet values such as openness, privacy and participation. He seeks to promote these values through his multiple Board-level appointments with some of the Internet’s most innovative and creative organisations. He is board chair (and a previous CEO) of Creative Commons, a non-profit organization devoted to providing tools to encourage legal sharing and reuse of creative works. He is also a Board Member of the Mozilla Foundation, which promotes openness, innovation and participation on the Internet and is best known for its Firefox browser; as well as several others including the Electronic Privacy Information Centre and Global Voices, a network of bloggers focusing on free speech. Ito is also a highly successful technology entrepreneur, co-founding Eccosys in 1994, which eventually became Digital Garage, a public Japanese Internet company operating a group of Internet media and commerce assets, Infoseek Japan, the first commercial Japanese search engine and PSINet Japan, the first commercial Internet service provider in Japan. He was also an early investor in more than 40 companies, including Flickr, Last.fm, Six Apart, Twitter and Kickstarter. He is the founder and CEO of the venture capital firm Neoteny Co., Ltd., and general partner of Neoteny Labs Startup 1, an early-stage investment fund. He has previously received numerous honours, including being listed as one of BusinessWeek’s ’25 Most Influential People on the Web’ in 2008, and one of the World Economic Forum’s ‘Global Leaders for Tomorrow’ in 2001. 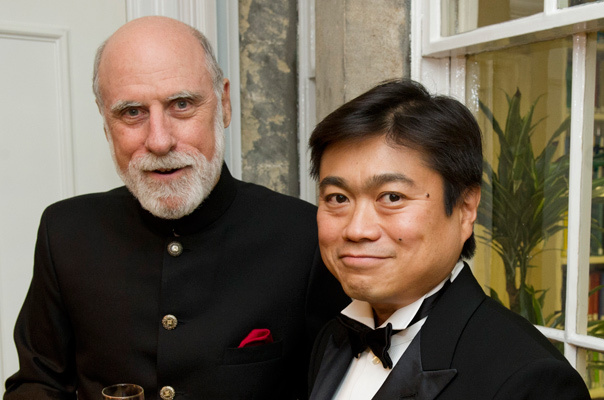 The award was presented on 22 September 2011 in Oxford, at a Gala Dinner celebrating the tenth anniversary of the founding of the Oxford Internet Institute (OII). The OII Awards are purely honorary and do not involve any financial reward.